Richard Frank was born on February 6, 1940, in Pennsylvania. He entered Officer Training School on June 28, 1963, and was commissioned a 2d Lt in the U.S. Air Force at Lackland AFB, Texas, on September 24, 1963. Lt Frank next completed Undergraduate Pilot Training and was awarded his pilot wings at Vance AFB, Oklahoma, in December 1964, followed by service as a C-130 Hercules and then C-141 Starlifter pilot with the 76th Military Airlift Squadron at Charleston AFB, South Carolina, from January 1965 to December 1967. During this time, Lt Frank made several deployments in support of operations in Southeast Asia. 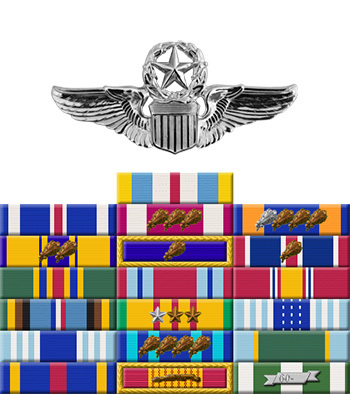 His next assignment was as an HC-130H/P rescue crew pilot, rescue crew commander, and aircraft commander with the 79th Aerospace Rescue and Recovery Squadron at Andersen AFB, Guam, from December 1967 to May 1970, and then as an HC-130P aircraft commander with the 39th Aerospace Rescue and Recovery Squadron at Tuy Hoa AB and Cam Ranh Bay AB, South Vietnam, from May 1970 to May 1971. During this time, Capt Frank served as the pilot on the HC-130P "Lime One" during the Son Tay Raid, a clandestine mission to rescue American Prisoners of War in North Vietnam on November 21, 1970. He attended Special Investigator Agent training from May to September 1971, and served as a Special Agent, as an Investigative and Counterintelligence Officer, and finally as Chief of the Counterintelligence Division with the 1005th Special Investigations Group at McGuire AFB, New Jersey, from September 1971 to July 1974. Maj Frank attended Air Command and Staff College at Maxwell AFB, Alabama, from July 1974 to July 1975, and then served as Chief of the Flying Training Branch with the U.S. Air Force Instrument Flight Center at Randolph AFB, Texas, from August 1975 to December 1977. 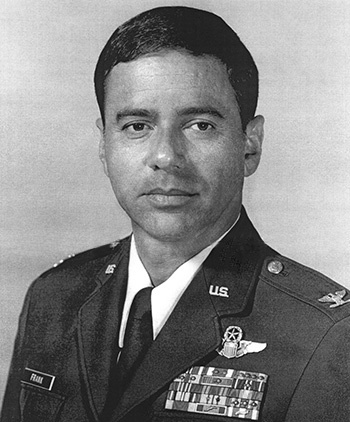 He next served as a Strategic Air Operations Officer, as an Operational Programming Officer, and then as Chief of the Planning, Programming, and Budgeting System Branch in the Directorate of Programming and Policy with Headquarters Military Airlift Command at Scott AFB, Illinois, from January 1978 to August 1980. LtCol Frank served as Operations Officer of the 36th Tactical Airlift Squadron at McChord AFB, Washington, from August 1980 to May 1982, followed by service as Commander of the 62nd Tactical Airlift Squadron at Little Rock AFB, Arkansas, from June 1982 to June 1984. His final assignment was as Chief of the Policy Division and then as Chief of the Joint Warfare Center Division with U.S. Readiness Command, and then as Chief of the Deployment Plans Division with the Air Force Element of U.S. Transportation Command at MacDill AFB, Florida, from June 1984 until his retirement from the Air Force on July 1, 1987. Captain Richard E. Frank distinguished himself by extraordinary achievement while participating in aerial flight as Aircraft Commander aboard an HC-130P aircraft over hostile territory in Southeast Asia on 21 November 1970. On that date, Captain Frank coordinated and directed the efforts of strike and rescue forces in the immediate vicinity of two downed airmen and also performed two night aerial refuelings of helicopters involved in the rescue effort. His superior resourcefulness and positive command and control of all forces engaged in this extremely difficult combat recovery effort led to the successful rescue of the airmen from certain capture and possible death at the hands of hostile forces. The professional competence, aerial skill and devotion to duty displayed by Captain Frank reflect great credit upon himself and the United States Air Force.